Stantus Varrid is an Imperial commoner and former priest living in the Imperial City's Temple District. After neglecting his duties as a priest, Stantus now lives a rich and varied life in the Imperial City. His mansion is located in the very center of the Temple District and he sleeps on the second floor every night between midnight and 6am. He always starts the day with a two-hour breakfast on the ground floor, and then his schedule varies; on Morndas, Middas and Fredas, he strolls around on the ground floor until noon, when he travels to the Green Emperor Way and spends the afternoon there. He heads back to his house at 5pm, eats a quick dinner at 6pm, then heads down to the All-Saints Inn where he hangs out until his bedtime. On Tirdas he enters the Temple of the One from 8am until noon, when it he visits the popular Arboretum until his usual visit to the All-Saints Inn at 7pm. On Turdas, he will largely do the same, but will skip the Temple and head directly to the Arboretum at 8am. On Loredas, he spends the entire day on the ground floor of his house and eats a two-hour dinner at 6pm. On Sundas, at 8am, he travels to the Market District and strolls around until noon, then returns to his house and wanders on the ground floor until bedtime, interrupted only by his dinner at 6pm. There are a few exceptions to this schedule; during Light the Dragonfires, Stantus will stay barricaded inside his house while Mehrunes Dagon terrorizes the Temple District; he was also intended to play a role in the unfinished "Imperial Couriers" quest; at midday on the 22nd of each month, as long as Mariana Ancharia is still alive, he will head to the Black Horse Courier office and stay there for a brief moment before he resumes his usual routines. At midnight, on the 13th of each month, Stantus breaks off all his routines and leaves the Imperial City for a long, dangerous trip to Bruma. He crosses the Talos Bridge and heads around Lake Rumare using the Red Ring Road. Right after Aleswell, he heads north on the Silver Road which he follows for the rest of the trip. It usually takes him sixteen hours and he usually arrives at Bruma’s east gate at 4pm. 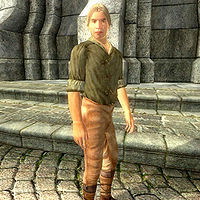 Once there, he quickly books himself in at the Jerall View Inn for two days of socializing with the many Nord regulars. When the clock strikes midnight on 15th, he heads back to the Imperial City. He wears a set of simple, lower-class attire, a collared shirt with tan linens and a pair of quilted shoes. He also carries his house key and a small amount of gold. When approached for the first time, Stantus will introduce himself and hint at his lack of faith: "Stantus Varrid. I'm not a priest any more... just a private seeker in search of white light." When asked about the Imperial City, he will elaborate: "Look around. Count the true believers. How many of these people really have faith? It's easy to have faith when everything's fine." Esta página foi modificada pela última vez à(s) 23h34min de 10 de maio de 2013.